Do you fancy a camera that runs Android? 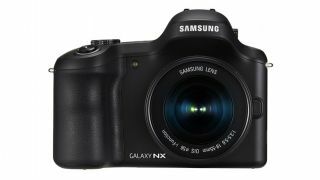 Samsung's Galaxy has been growing into the biggest tech brand on the planet and the latest product to roll off the production line is the Samsung Galaxy NX. It's Samsung's first interchangeable lens camera to come running Android and we've been looking forward to playing with it for ages. So is it as delicious as a real jelly bean or is it clunkier than a paranoid android? You'll have to read on to find out, and while you're here, you might as well stick around for the rest of the week's toys! Did you hear there's a couple of new iPhones in town? Ultimately, we're just not sure who this camera is aimed at. The professional who has this kind of money to spend on gear like this will no doubt get very quickly frustrated with some of the camera's problems, while the beginner who is likely to be tempted by the large screen and Android is unlikely to want to spend this kind of cash. Investing in surround sound can be a bit of a faff for a lot of people but Philips now has a way of making things a lot easier - and the idea isn't even that crazy. The Fidelio E5 consists of two sound towers designed to stand either side of your TV, along with a separate subwoofer. But the USP of the 2.1 sound system lies in its ability to be amputated. The Yoga 2 Pro does have some interesting new extras. We tried out the in-built Yoga Chef, which has a load of recipes for you to try out when the Yoga Pad 2 is in the kitchen. So far so normal, but gesture controls meant we could swipe through the recipe without getting our mucky paws on the screen.